This month’s challenge is Super Simple, but it’s also Super Powerful. Commit to 21 Days of Exercise! 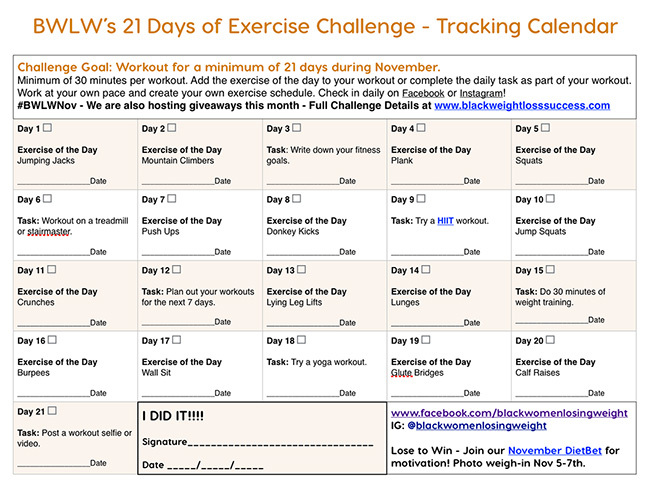 Challenge Goal: Workout for a minimum of 21 days during November. You’ll find this month’s daily tracking calendar below. Each day, you’ll include the Exercise of the Day listed on the calendar as part of your regularly scheduled workout, or you’ll complete the daily task in addition to your workout. We suggest that you take at least one rest day per week. We all get busy during the holidays, and it can be challenging to stay committed to your workout routine. This challenge allows you to create an exercise schedule that works for you. Keep track of your workouts using our Tracking Calendar. 1. Leave a comment below and tell us why you are joining this month’s self-guided challenge. 4. Share your Workout Selfies. 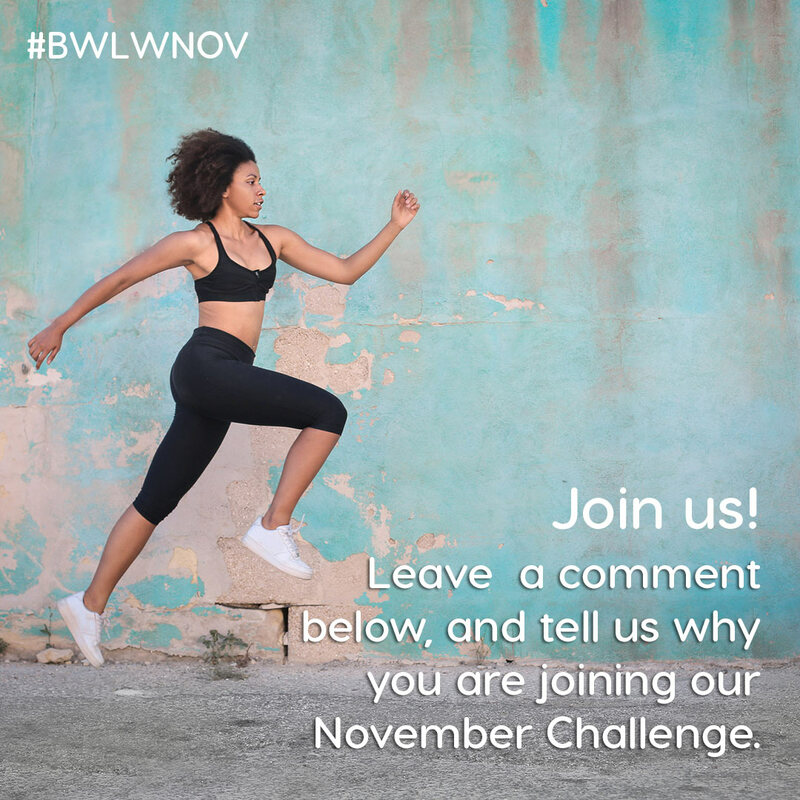 Use the Challenge Hashtag #BWLWNov when you post workout selfies. PS: If you haven’t joined our email list yet, sign up today. I’m excited to do this challenge. I will already have a pretty strenuous workout plan in place (I’m starting on Monday!) but will try to include the daily exercises. Even if it’s just doing a few at work. I look forward to printing this chart out and adding it to my goals board. I want to do this work out because my recent depressive episodes have caused me to gain back some of the weight I previously lost. I need a support group to help me stay motivated. I am inspired by all the women who have been featured for their courageous success. 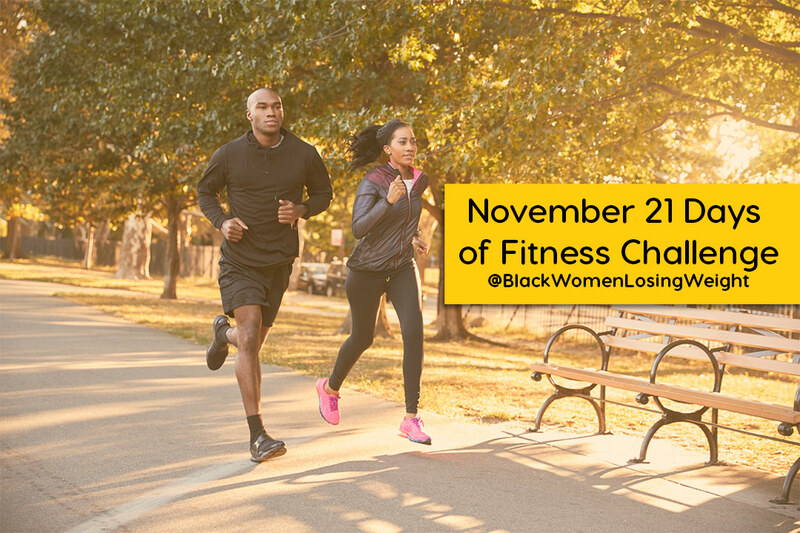 Am looking forward to the November 2018 Exercise Challenge. Have incorporated the Walking Challenge in my life and now walk every day whether on the walking trail, mall walking, SuperStore Walmart. The October Clean Eating is still ongoing — its challenging & rewarding. The November Structure Challenge couple with what I have learned will produce some great results. Gladly accept this month’s challenge!! My New Year is NOW!! I am doing the challenge. I am excited. 2019 is my year! No more excuses. Starting now. Let’s get it! It’s time to take my life back! I am embarking on this challenge bc I need to get back to working out and being accountable. I has surgery a year ago come November. I have been off track ever since. It’s time to take it seriously again and get back to a healthier lifestyle. I’m in! Just got back from a vacation where I was moving my body a lot and eating good foods so I feel like I’m ready to be on track at home. I need to l lose 15-20 pounds by December and 60 pounds by the end of February. I’ve tried to do it totally by myself but I need a little more motivation. I cant wait to start. Just continuing on this journey. I started at 211lbs. Today I am 178lbs. I plan to lose another 10lbs in the month of November. Let’s get it!!! Hi BWLW ladies! I just need to get back to moving the body. I believe this is a great opportunity to remain accountable. November is my birthday month. I want to join the challege to be a better me. This is my gift to myself. Better Mind, Body, Spirit and soul. I really need to jump start my weight loss journey mainly due to my high blood pressure. Feeling slow, weak at times and just not healthy. Looking forward to completing this challenge to prove to myself that I can do it. I am excited about the November challenge. I’m new on this weight loss journey and glad I have a place to push myself. I was in a steady exercise routine until I tore my Achilles. Now, I’m looking to get back at it like I was, except with some modifications to ensure no more injuries. I am excited and ready to lose some weight, gain some clarity and release some stress! I want to do this challenge to help hold myself more accountable in this lifestyle change. I want to be a new better me! I actually made up my mind and started my journey in September and in that short time there has been an up and down thing happening. I’m joining the challenge in hopes that it will jumpstart the habit of working out on a routine basis. I’m doing the challenge to get back on track. This will hold me accountable. I am doing the challenge to get back on track, to maintain a steady and healthy workout habit. To push myself more and to lose weight. This will be an ideal great start for me. I am excited to join in I just started back at the gym and have been a little slow at it this will be a great accountability for me!! Im excited plus its nice to get ahead of the holiday weight!! I am in for the November challenge. Turning 55 on 11/8, I would like to start living my best life, spiritually, physically and mentally. I am turning 55 0n 11/8, My desire is to live my best life spiritually, physically and mentally. I will like to lose 50lbs before 2-6-19. Committing to this challenge will help. I am doing the challenge to get healthy. I can always find an excuse but I need accountability in my life. I owe it to myself to find the time on a regular basis to exercise and eat right. Thanks! No more excuses I have to do it. I am already eating better…cleaner. This challenge will up my accountability regarding physical activity and hopefully provide some support. Getting back on track! Want to reaxh my goal weight of 140 to 145!! Trying to get back on track! Need to get back to my goal weight of 155 to 160 lbs. hopefully this challenge while give me the jump start I need to lose these 10 to 15 lbs! I am in for the November challenge. I am trying to get my life on track before I turn 40 next year. I had been doing another challenge. That one got boring because it goes back and forth doing the same things over and over. I have T1 Diabetes and Hypothyroidism and need to feel better. Just tired of starting over. November is my birth month and am super excited to take on this challange . I am joining the challenge for accountability support and tips. I have be working out daily for 3 weeks now and I’m feeling great. I have to do something good for me once in my life. I am joining the November Challenge. I am the heaviest I’ve ever been. My weight has not only affected my energy level and motivation – but now my self-confidence; something Ive never let it do before. It is time! I’ll be 40 in a little over a year and I don’t want to go into my middle age knowing better and not doing better! Just saw this so I will began today. Never to late to start living a healthy lifestyle. I’m jooning today. I just saw the challenge ! I gained alot of weight before and after my pregnancy. My baby is almost 18 months old and I realise I need help. I’m a little behind but I’m joining anyway! !